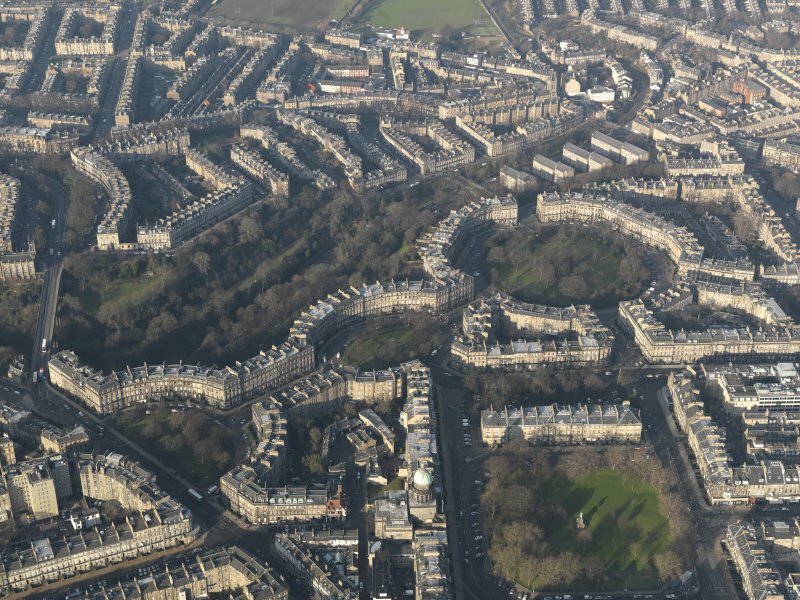 Edinburgh, oblique aerial view, taken from the SW, centred on Moray Place, with the New Town across most of the photograph. 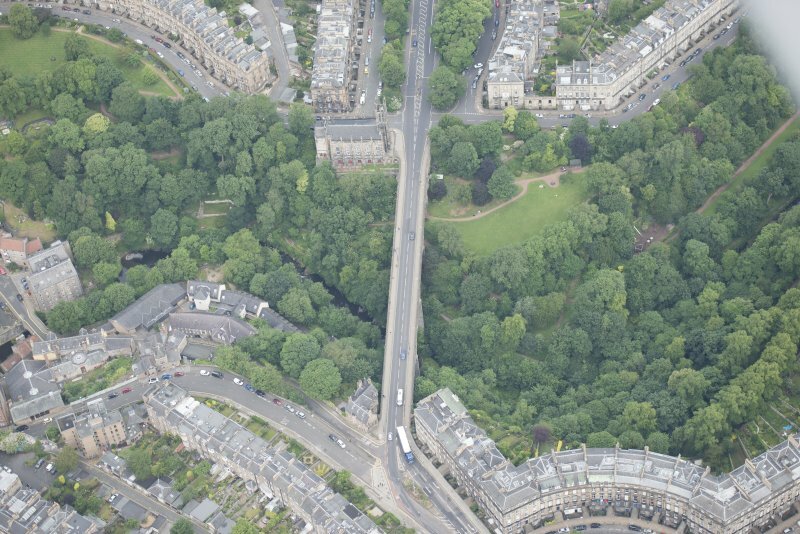 Dean Bridge is in the bottom left-hand corner. 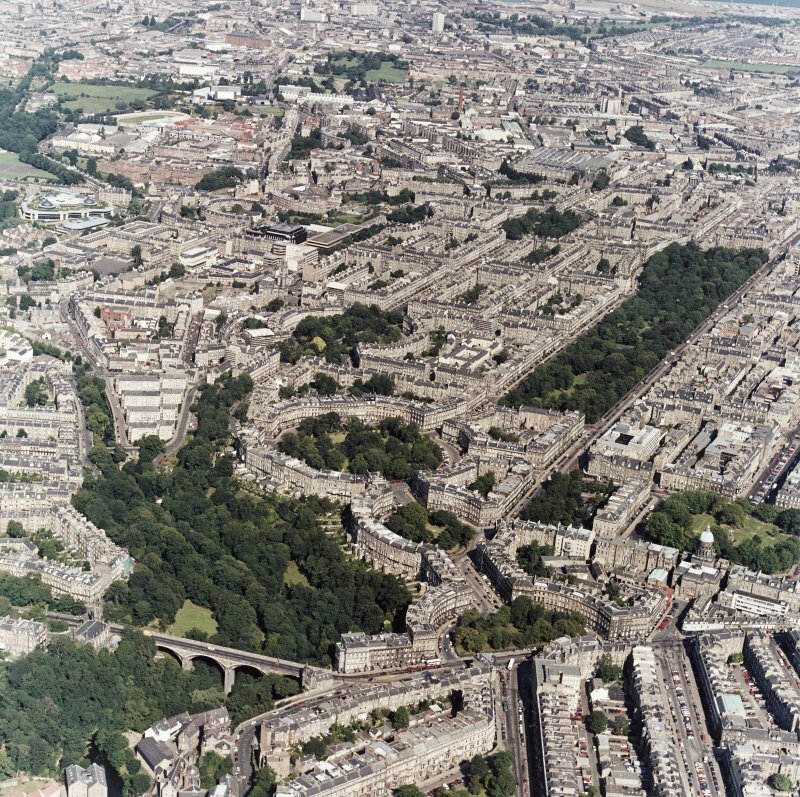 Edinburgh, oblique aerial view, taken from the WSW, showing the New Town in the centre right of the photograph. Oblique aerial view of Dean Bridge, Holy Trinity Episcopal Church. 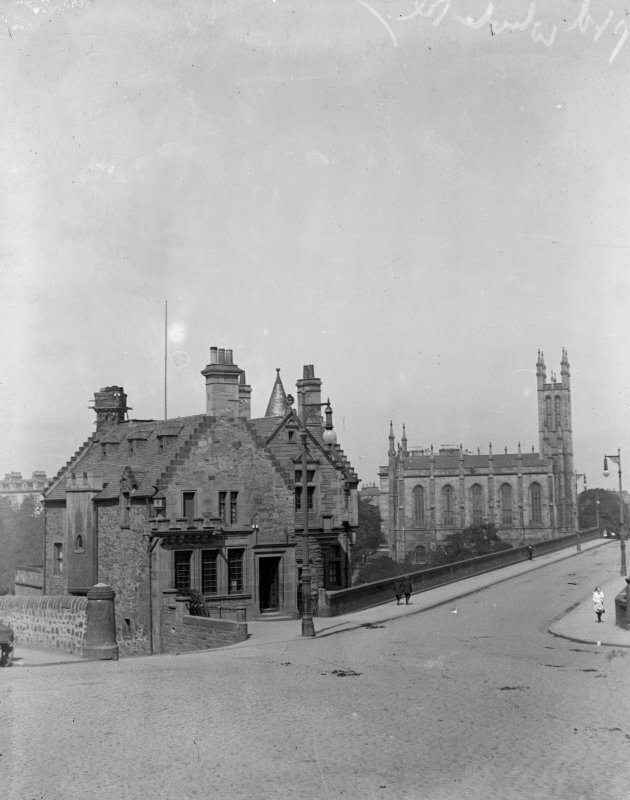 Lynedoch Place and Miller Row Granary, looking SSW. 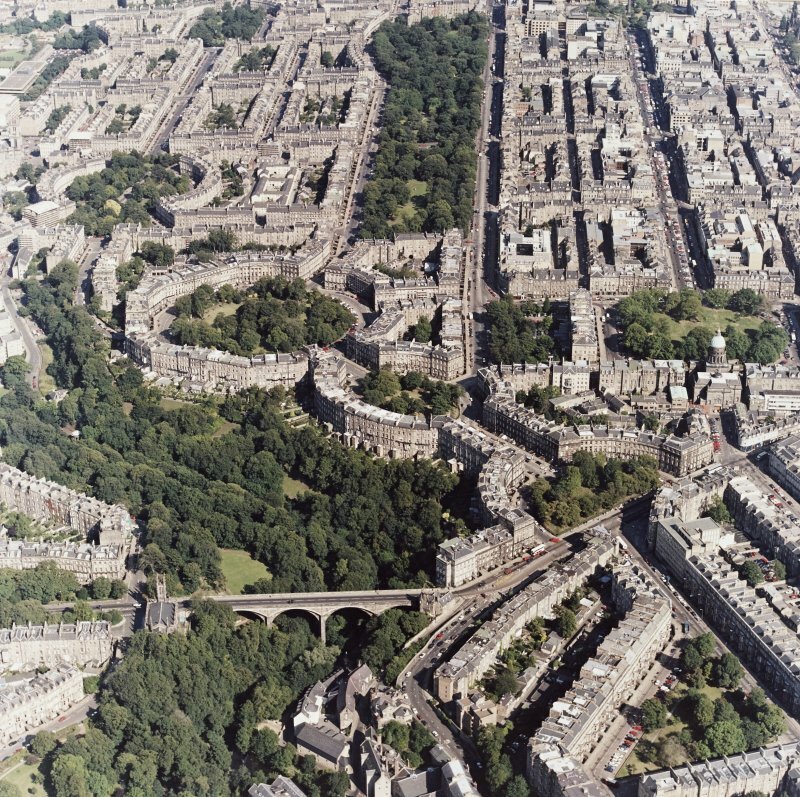 Oblique aerial view of Dean Village, Damside, Dean Path, Dean Bridge, Rothesay Terrace and Drumsheugh Baths, looking NNW. 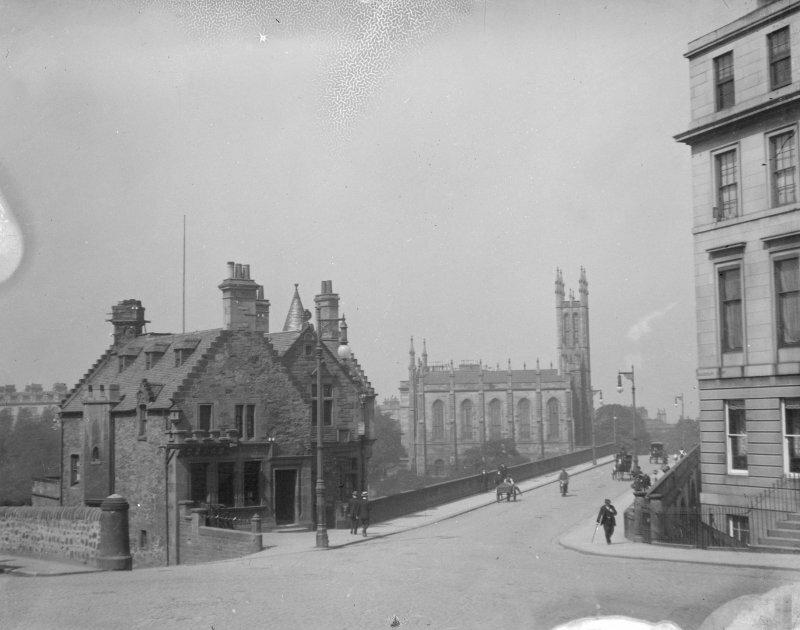 Postcard showing view of Dean Bridge, 10 Randolph Cliff and Holy Trinity Church, Edinburgh, with cars and horse drawn vehicles crossing the bridge. 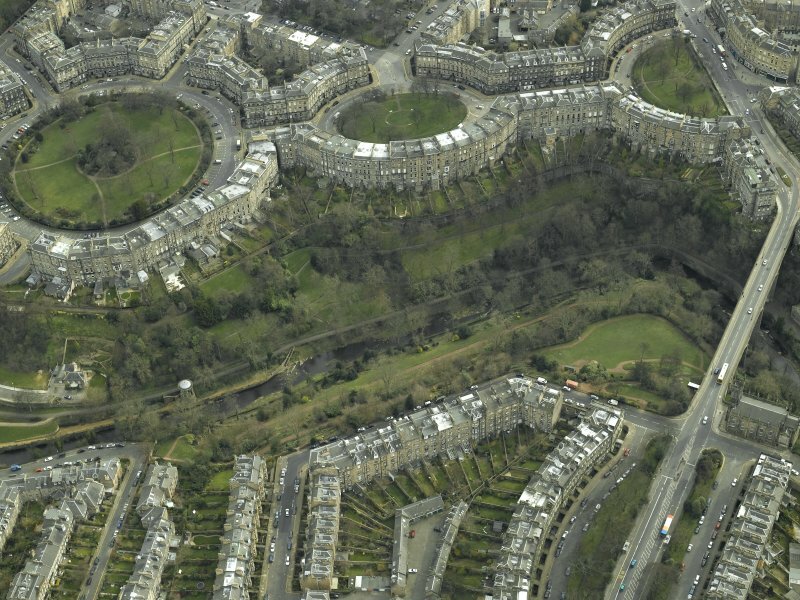 General oblique aerial view centred on the New town Crescents and Gardens built on the former Moray Estate, taken from the S.
Oblique aerial view centred on the park and gardens with the road bridge adjacent, taken from the NE. 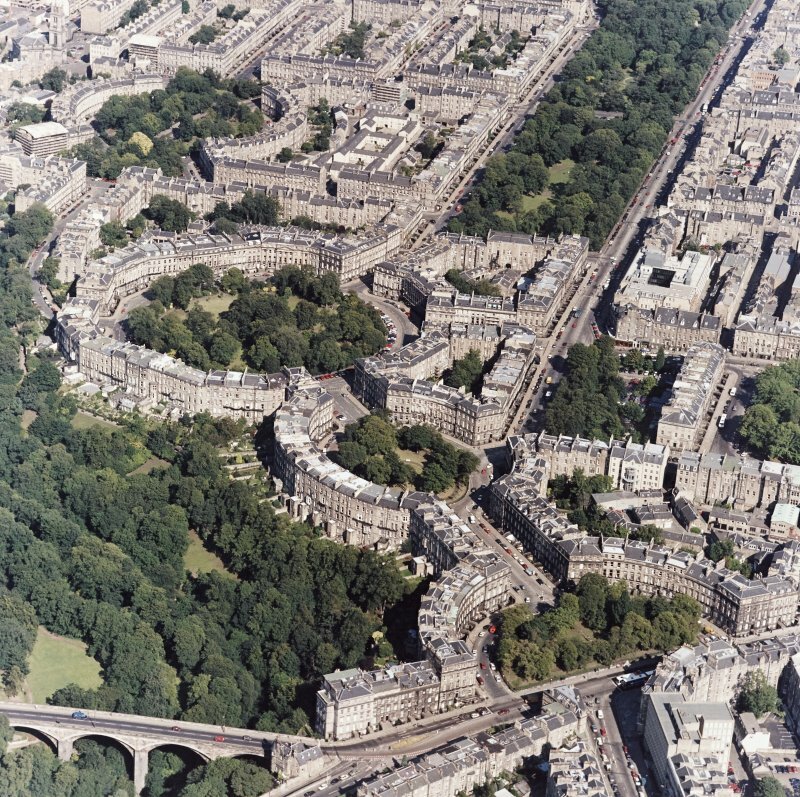 Edinburgh, oblique aerial view, taken from the WSW, centred on Moray Place, and with the New Town visible across the top half of the photograph. Dean Bridge is at the bottom. 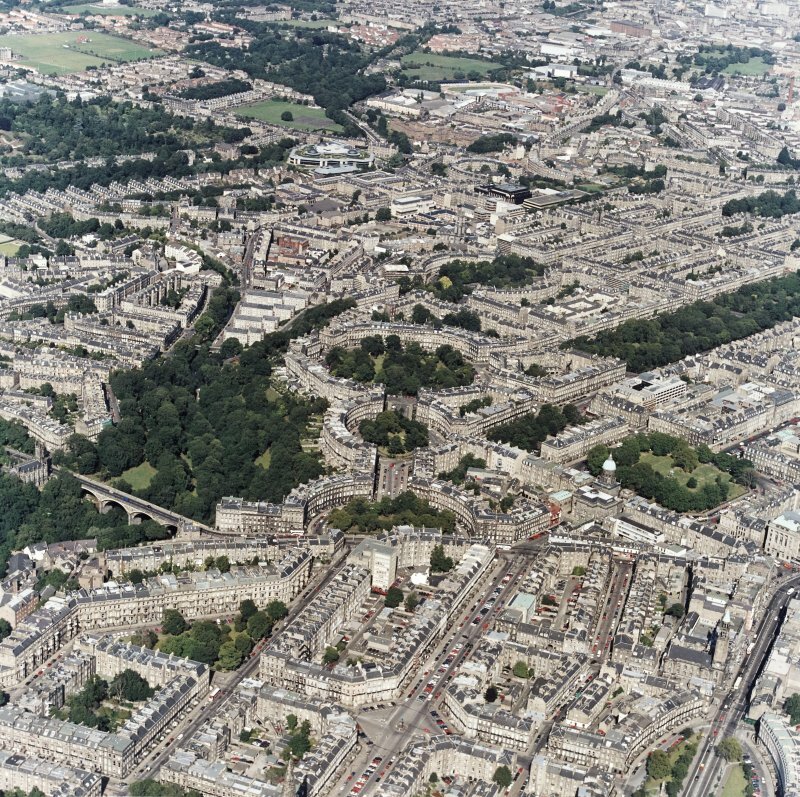 Oblique aerial view of Dean Bridge, Eton Terrace, Randolph Cliff and Holy Trinity Episcopal Church, looking NW. 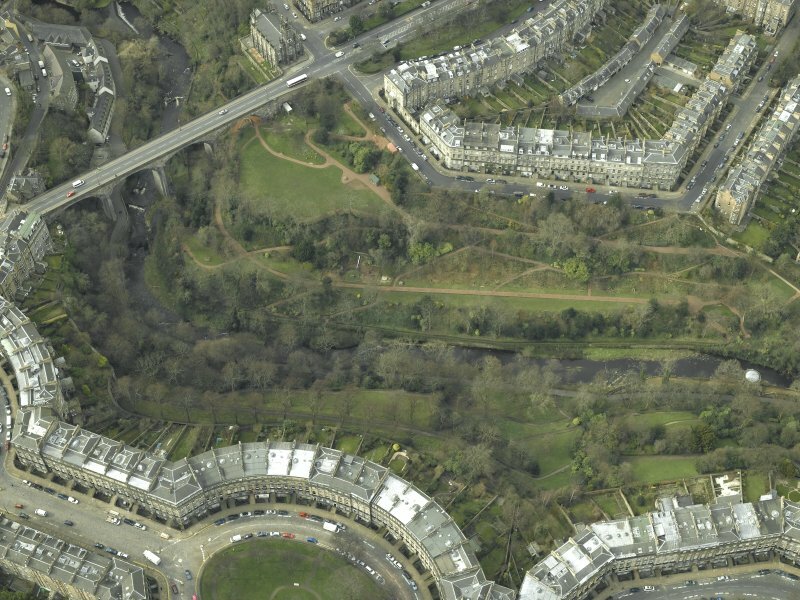 Oblique aerial view of Dean Bridge, Ainslie Place, Water of Leith, looking SSW. 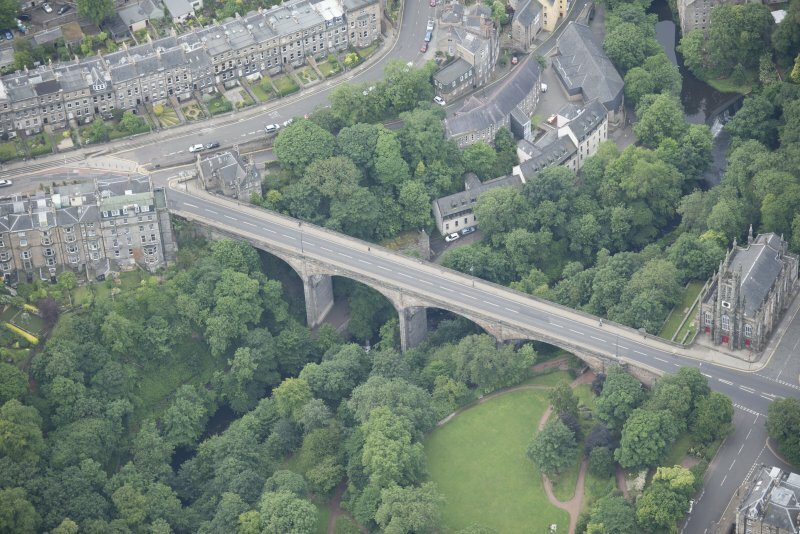 Oblique aerial view centred on the Dean Bridge, taken from the SE. Digital copy of elevation of Dean Bridge. 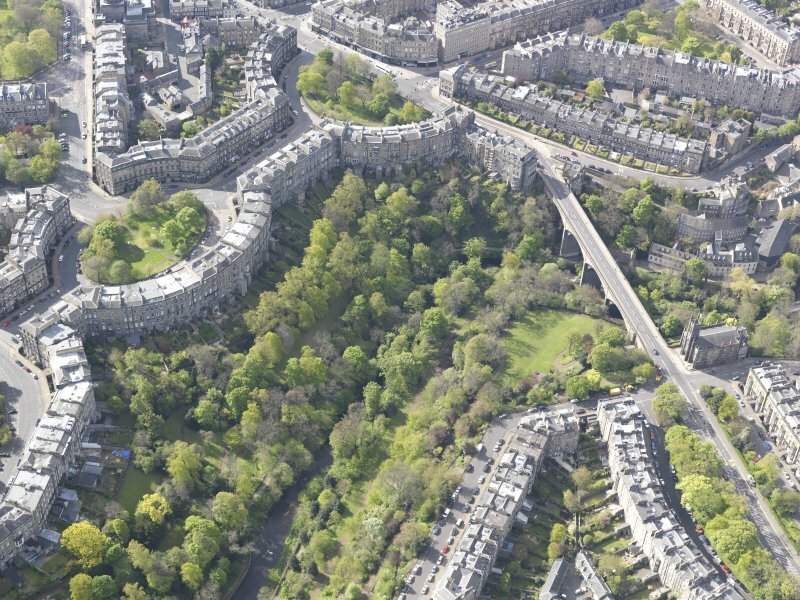 Oblique aerial view centred on the park and gardens with the road bridge adjacent, taken from the ESE. 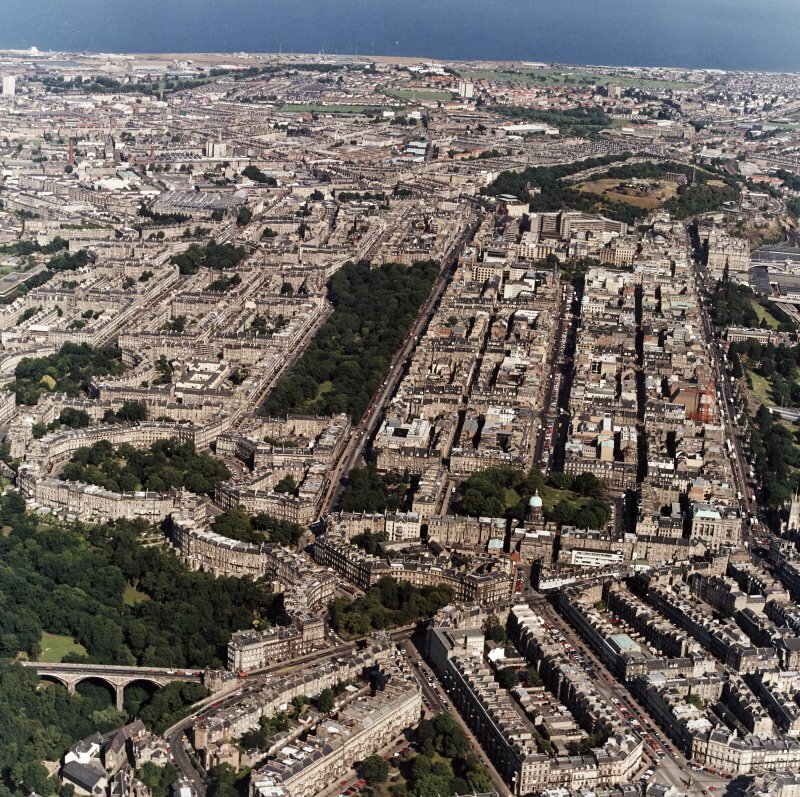 Edinburgh, oblique aerial view, taken from the SW, centred on Moray Place, with the New Town visible across much of the photograph. 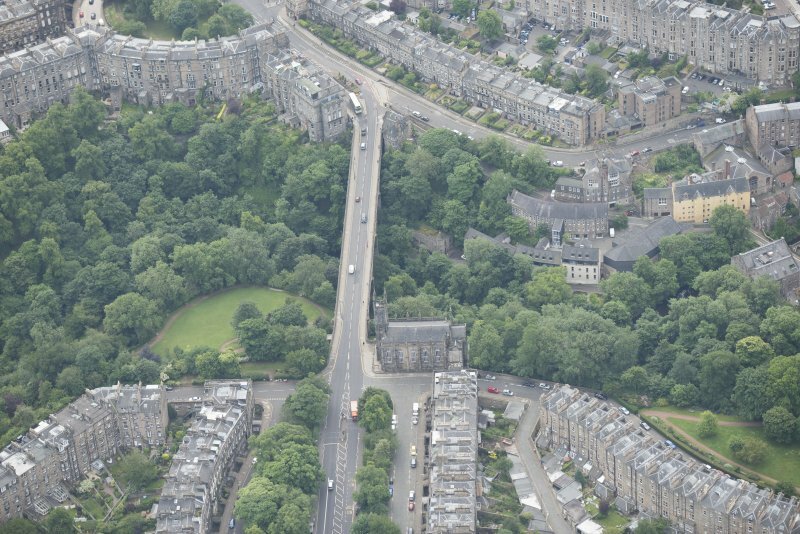 Oblique aerial view of Lynedoch Place, Dean Bridge and Holy Trinity Episcopal Church, looking ESE. 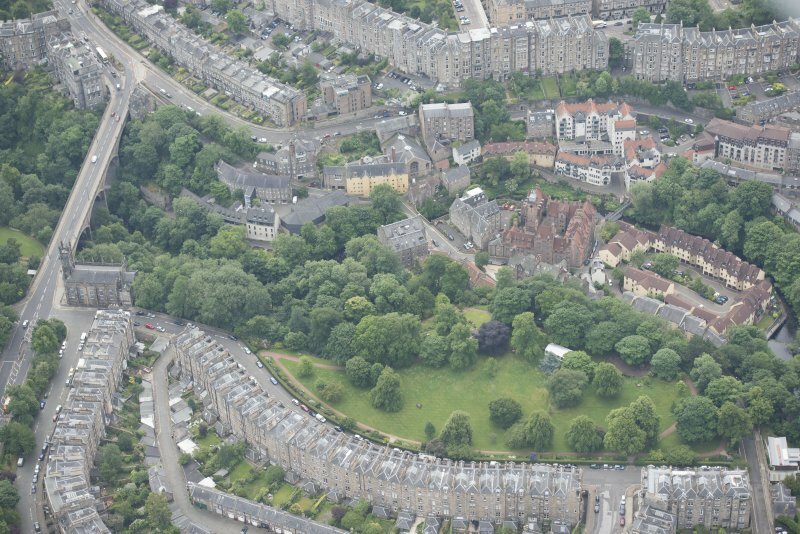 Oblique aerial view of Dean Village, Dean Path, Dean Bridge and Holy Trinity Episcopal Church, looking SE. 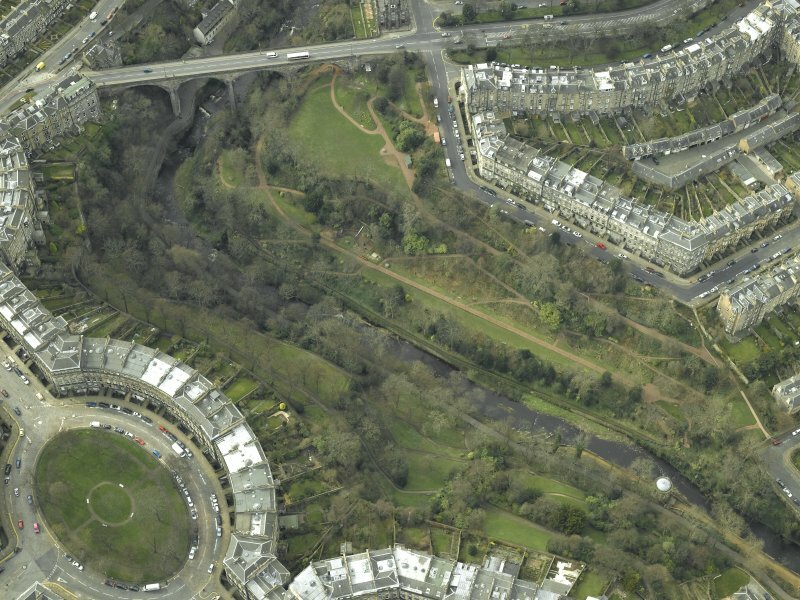 Oblique aerial view centred on the park and gardens with the road bridge adjacent, taken from the NW. 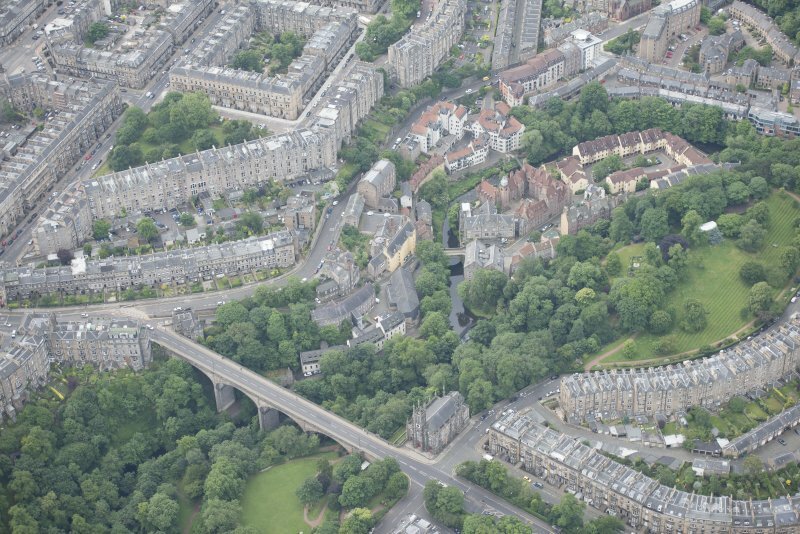 Oblique aerial view of Stockbridge centred on the church and bridge, taken from the SSW. 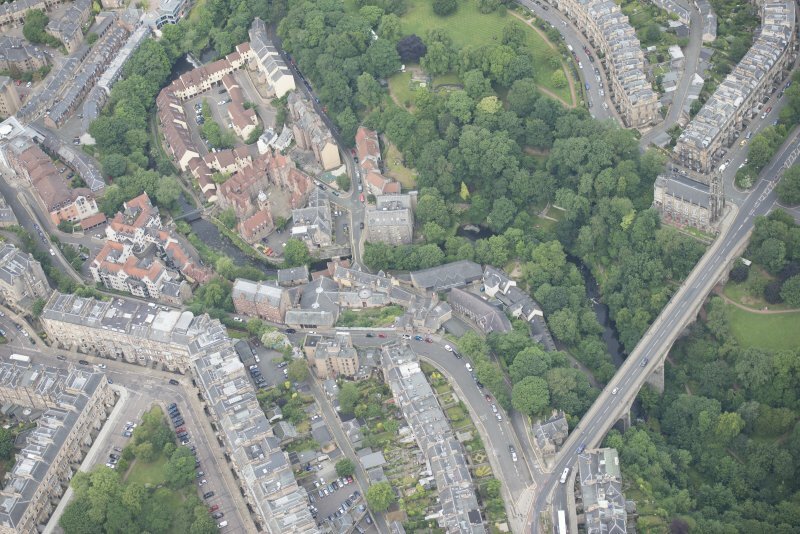 Oblique aerial view of Miller Row Granary, Dean Bridge and Holy Trinity Episcopal Church, looking E.
Oblique aerial view centred on the Dean Bridge, taken from the SW.
Edinburgh, oblique aerial view, taken from the WSW, centred on Moray Place, and with the New Town visible across much of the photograph. Dean Bridge is at the bottom. 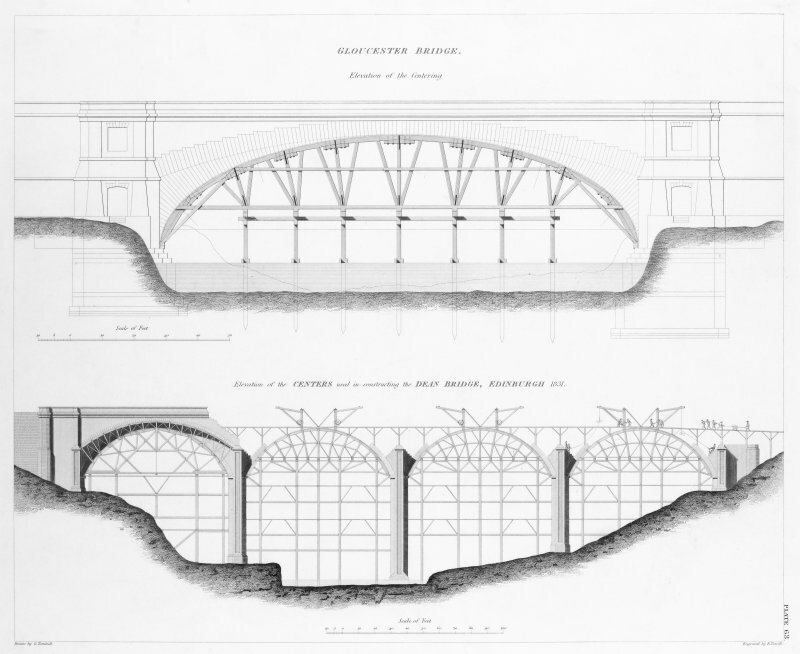 Engraving of elevation and plan inscr: ''Gloucester Bridge. Elevation of the Centering.'' 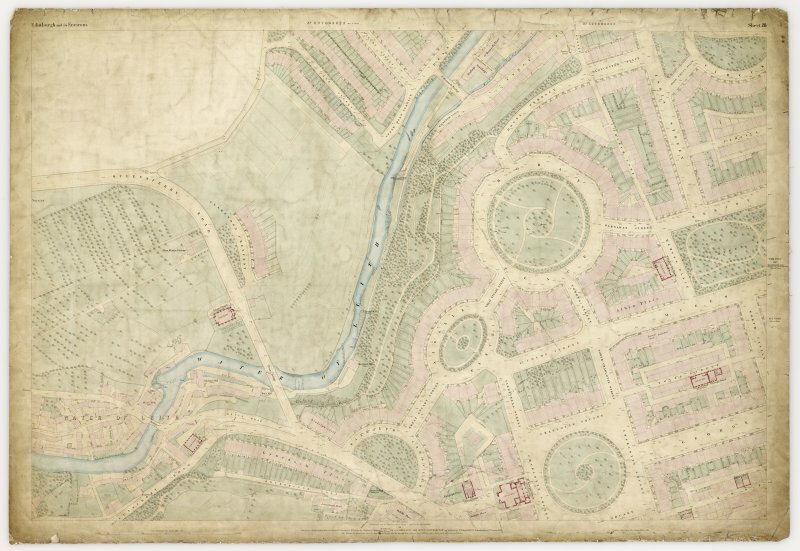 Also includes Elevation of the centers used in constructing the Dean Bridge, Edinburgh 1831. Oblique aerial view of Dean Bridge, Holy Trinity Episcopal Church. 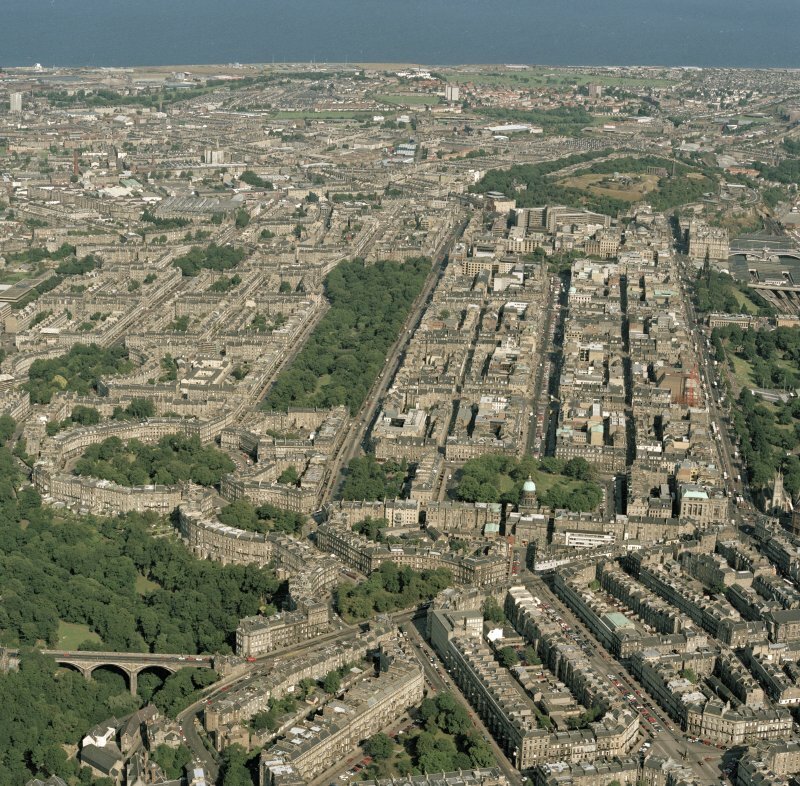 Lynedoch Place and Miller Row Granary, looking W.
Oblique aerial view of Dean Village, Damside, Dean Path, Dean Bridge, Rothesay Terrace, Belgrave Terrace and Holy Trinity Espicopal Church, looking WNW. 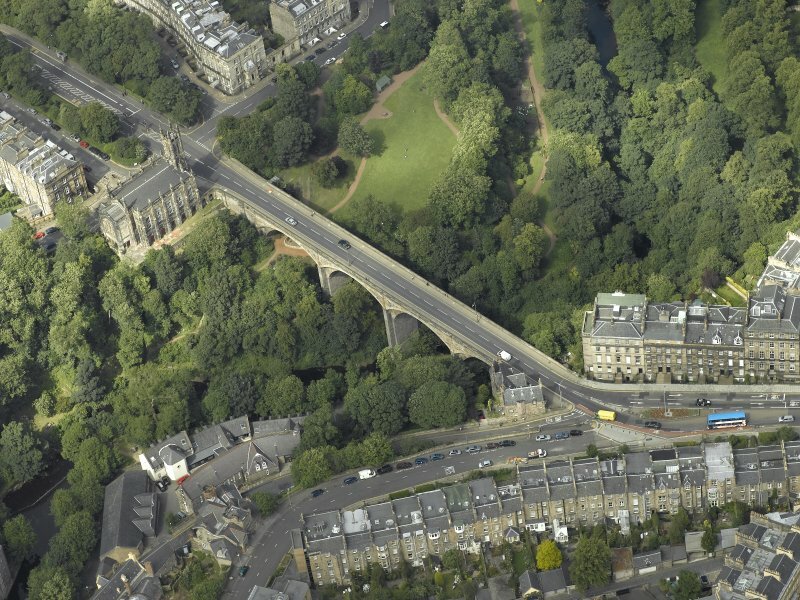 Oblique aerial view of the Dean Bridge and Holy Trinity Episcopal Church, looking SSE. 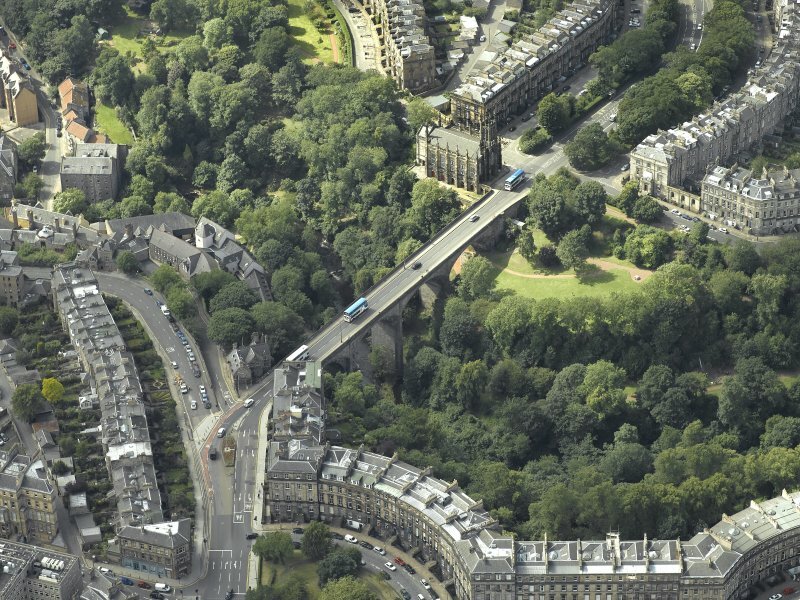 Oblique aerial view of Randolph Cliff, Lynedoch Place, Dean Bridge and Holy Trinity Episcopal Church, looking SSE. Interior view of the Dean Bridge showing internal stairs of archway. 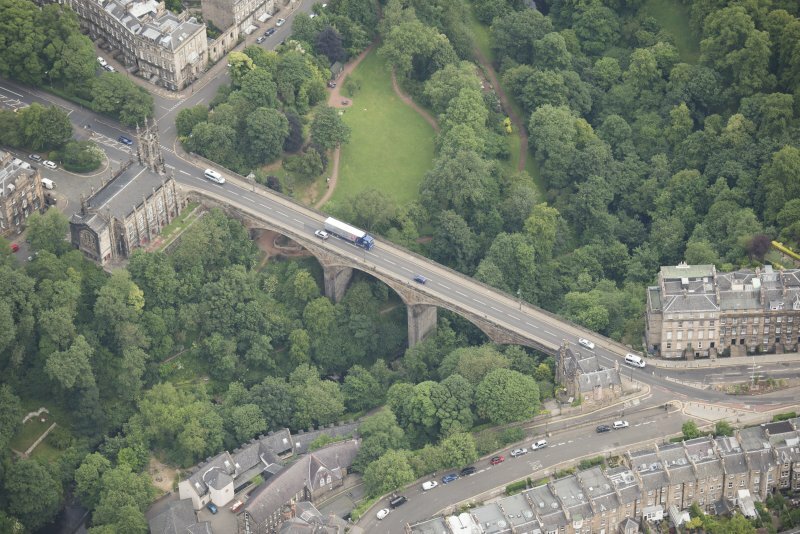 Oblique aerial view centred on the Dean Bridge, taken from the E.
Oblique aerial view centred on the Dean Bridge, taken from the SSW. 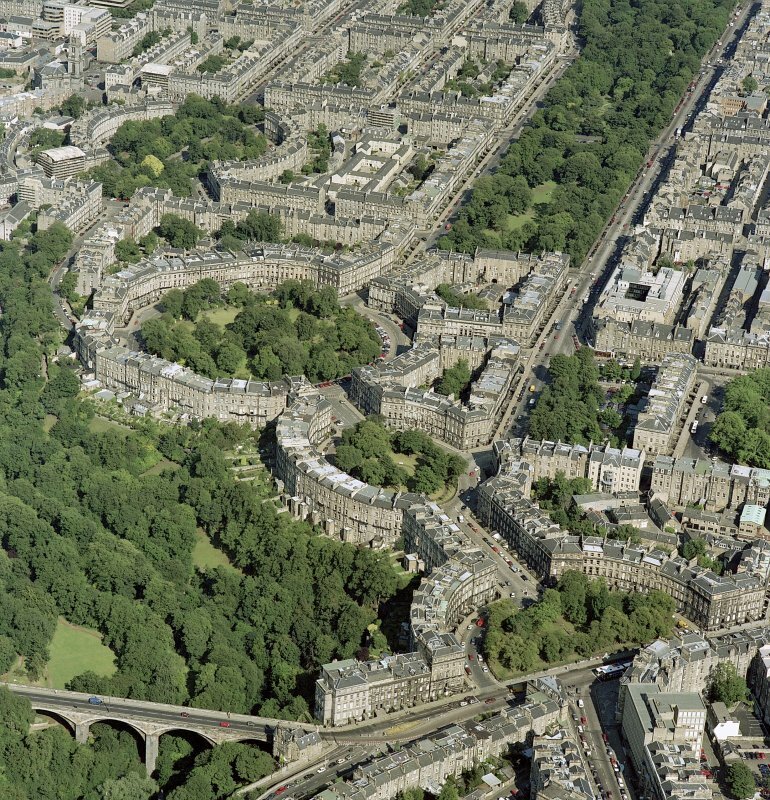 Edinburgh, digital image of an oblique aerial view, taken from the SW, centred on Moray Place, with the New Town across most of the photograph. 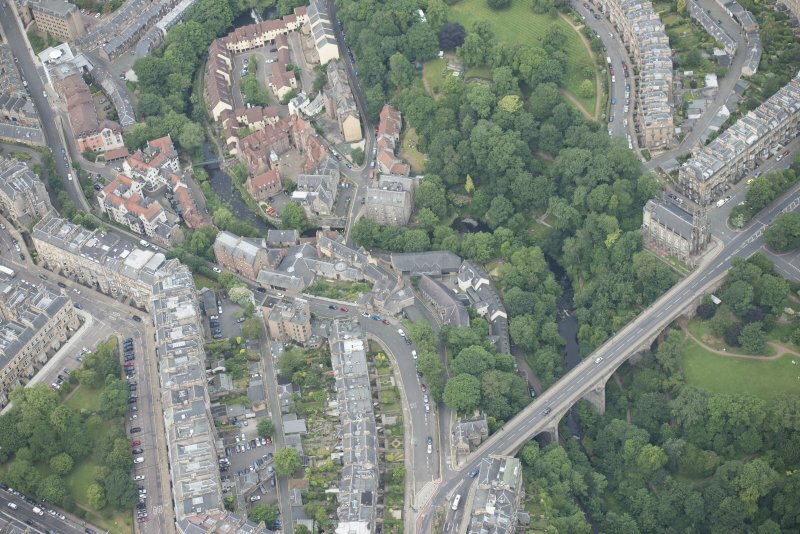 Dean Bridge is in the bottom left-hand corner. 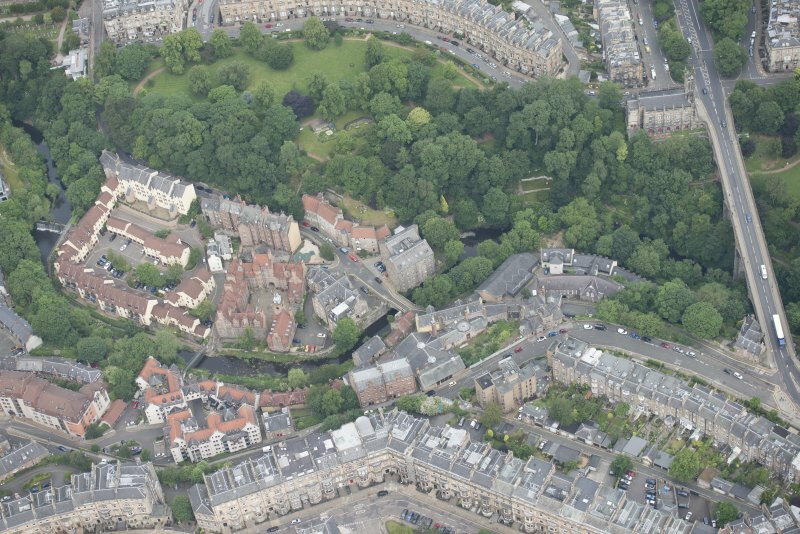 Oblique aerial view of Dean Village, Damside, Dean Path, Dean Bridge, Rothesay Terrace, Belgrave Terrace, Holy Trinity Espicopal Church and Drumsheugh Baths, looking NW. 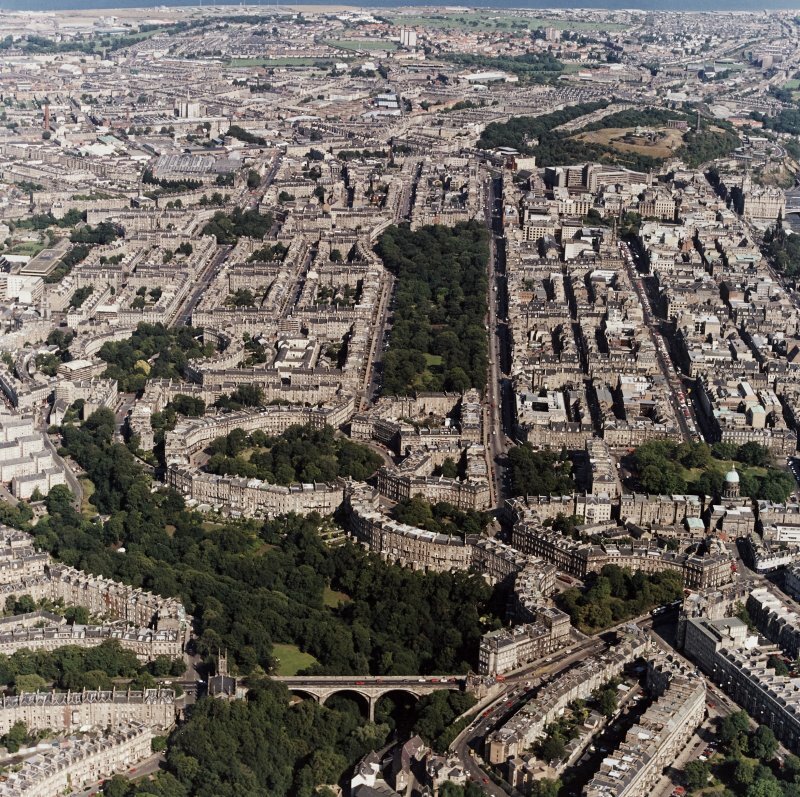 Edinburgh, oblique aerial view, taken from the SW, centred on Moray Place, and with the New Town visible across much of the right half of the photograph. 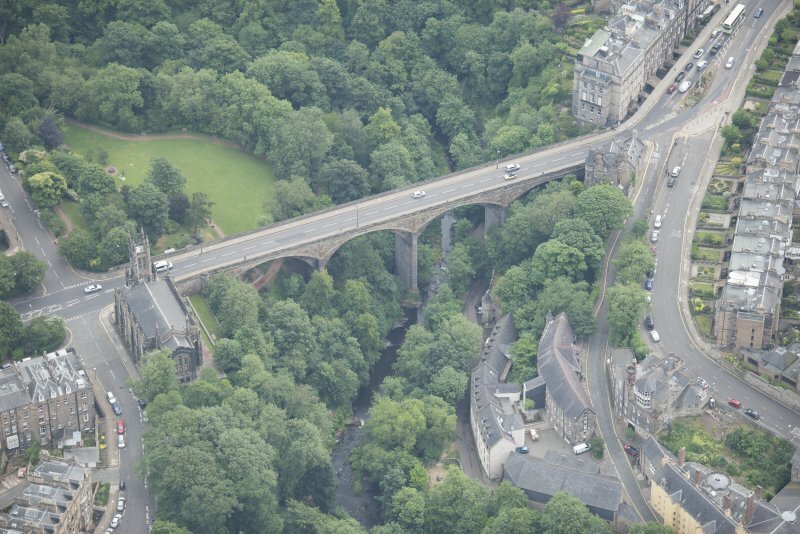 Dean Bridge is in the bottom left-hand corner. 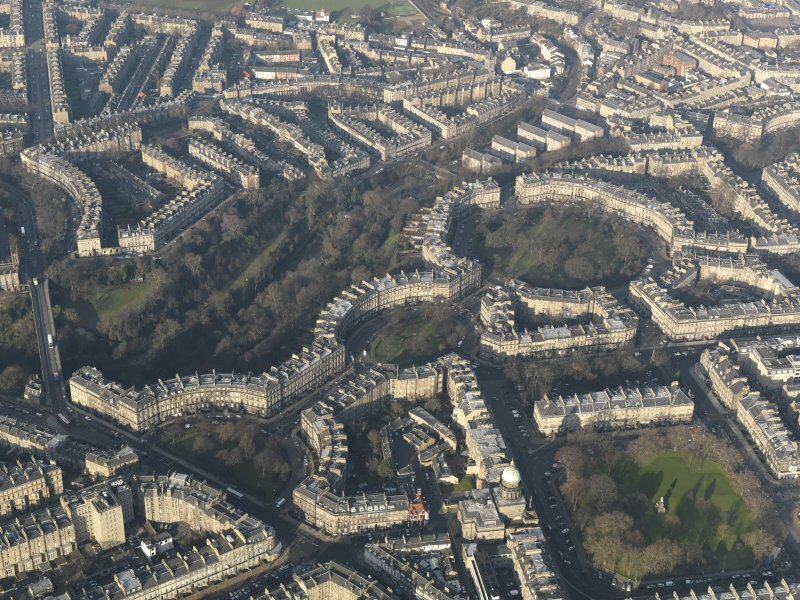 Digital image of Edinburgh, oblique aerial view, taken from the WSW, showing the New Town in the centre right of the photograph. 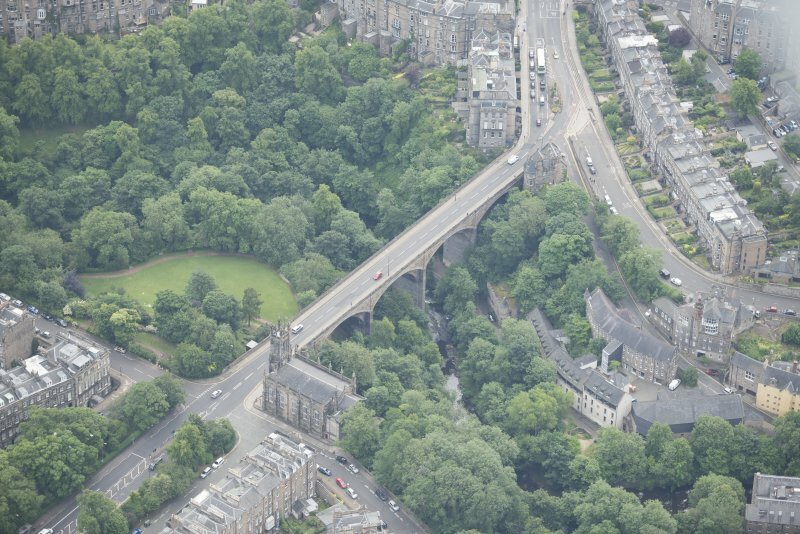 Oblique aerial view of Dean Bridge, looking SSE. 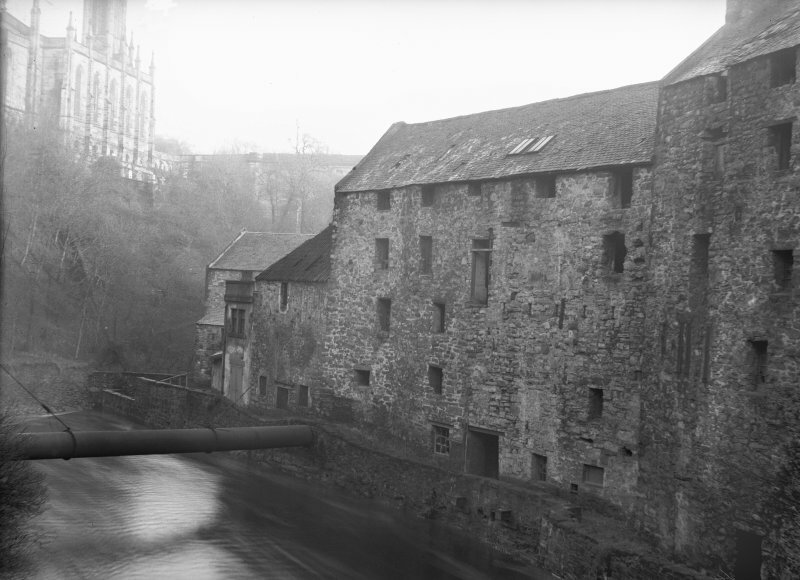 The construction of the Dean Bridge allowed the City of Edinburgh to grow to the north-west. 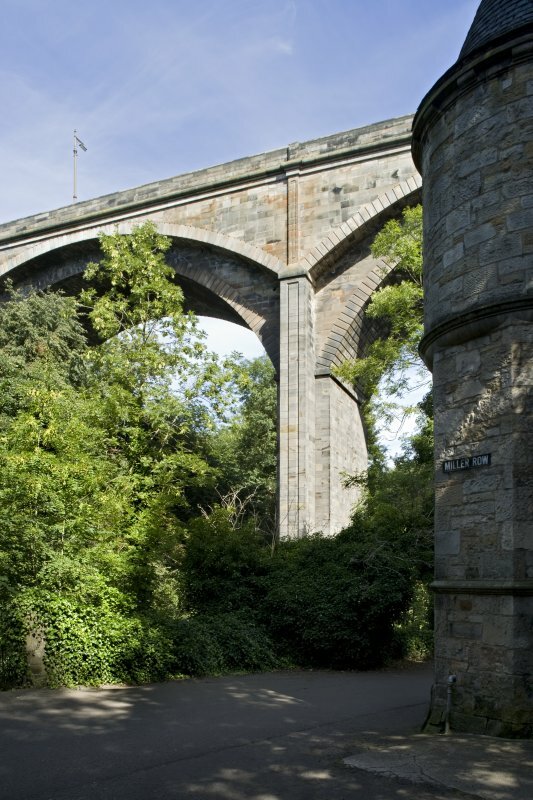 Built between 1829-31 to designs by Thomas Telford, the bridge crosses the gorge of the Water of Leith and is over 30m in height. 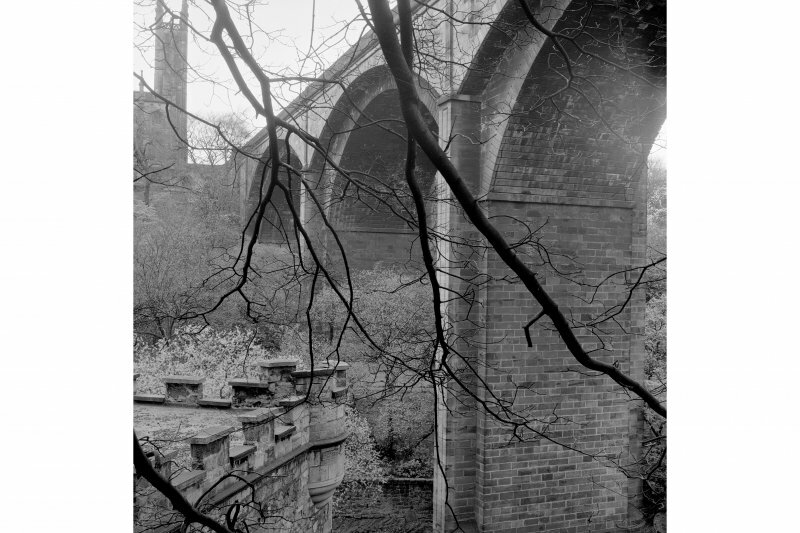 Telford originally designed a bridge with three arches, but difficulties in constructing the foundations meant a four-span bridge was built. Location formerly cited as NT 24271 74005. 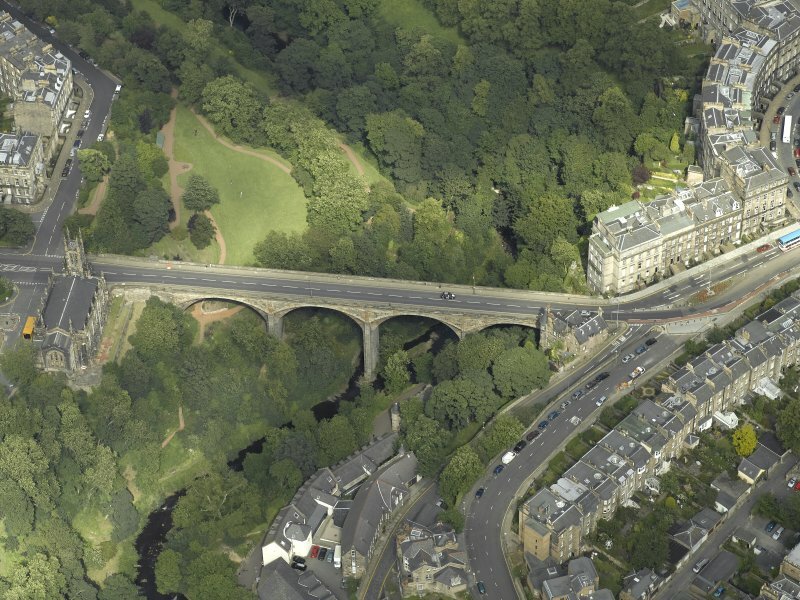 For (comparable) Lothian Bridge, Pathhead, see NT36SE 23. For prehistoric finds (bronzework and 'urns') found during the construction of the bridge and within its vicinity, see NT27SW 18. For corresponding low-level bridge (Belford Bridge, at NT 23793 73773), see NT27SW 639. 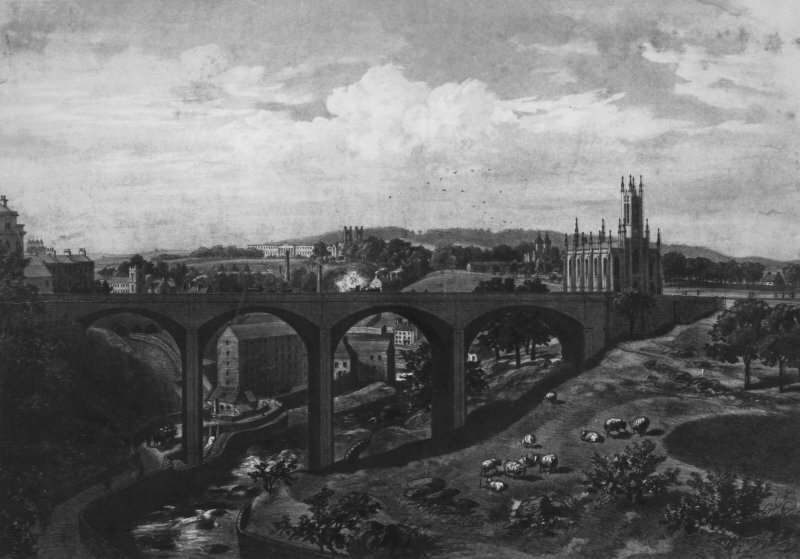 The construction of the Dean Bridge allowed the expansion of Edinburgh to the NW. (Location cited as NT 243 740). 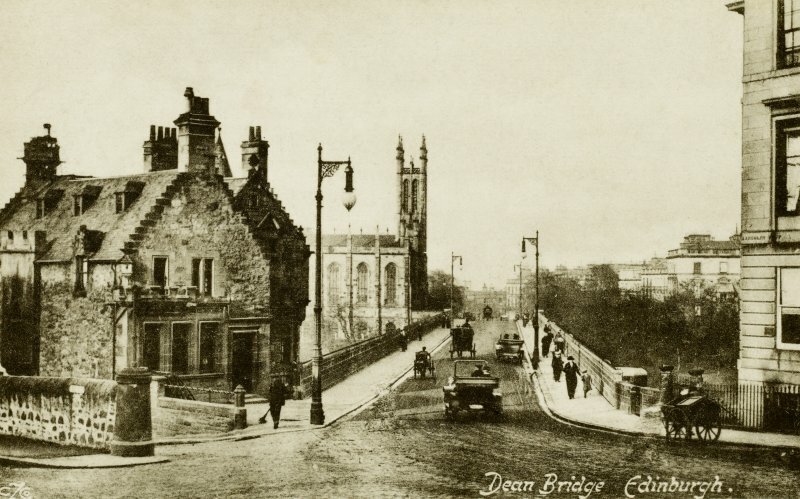 Dean Bridge, Queensferry Road, built 1829-31, engineer Thomas Telford. 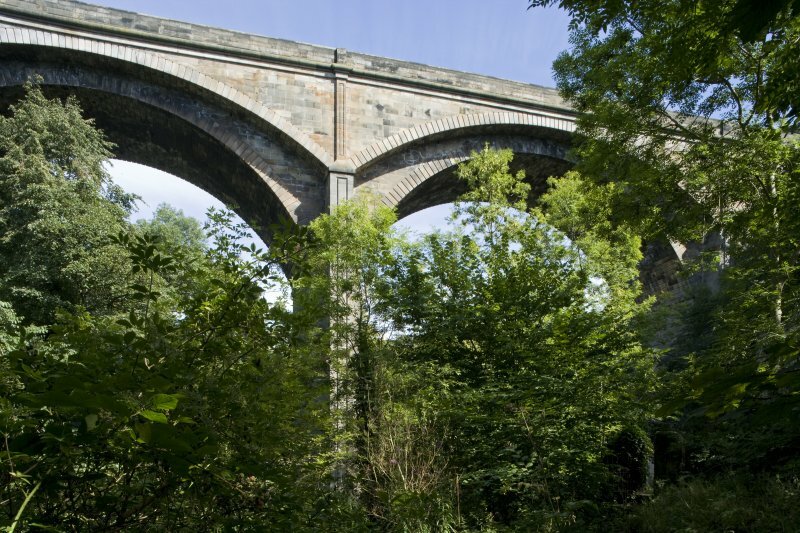 A magnificent 4-span, dressed-stone bridge, with heavy segmental arches supporting the carriageway and flatter arches supporting the footpaths. 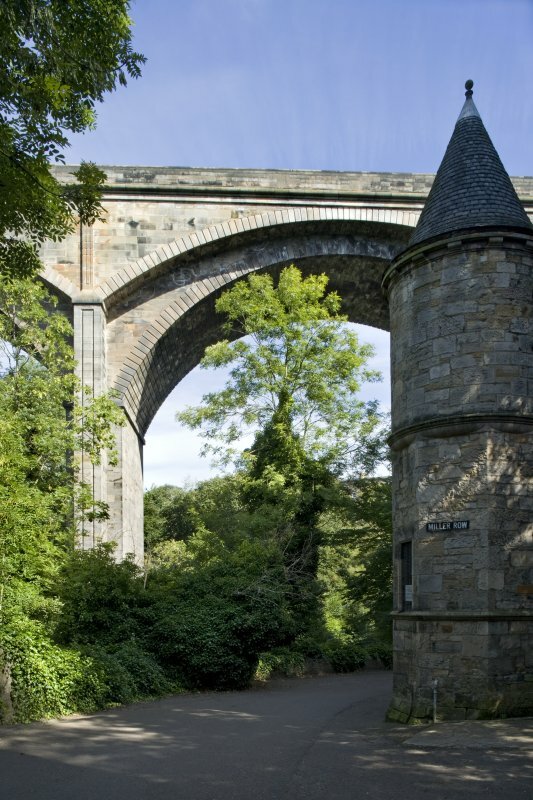 In one of the two last and greatest of the stone bridges designed by Telford, the Dean Bridge over the Water of Leith at Edinburgh, the arches are once again of unusual design. 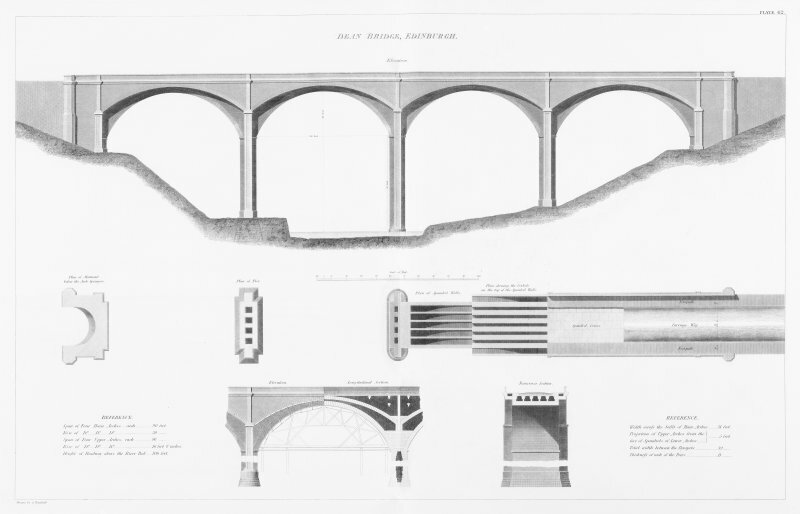 Foundation difficulties forced Telford to modify his original three-span design for the Dean Bridge to one of four arches, each of 90ft [27.4m] span and with a maximum height above water of 106ft [32.3m]. 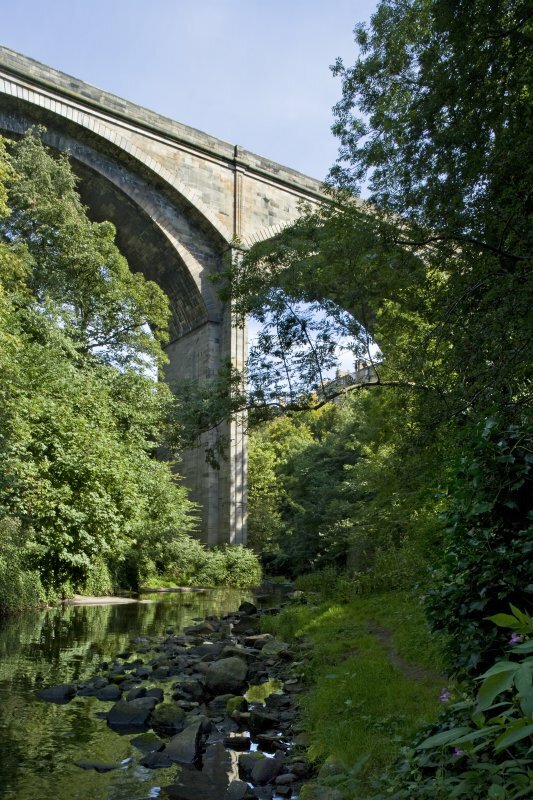 The main arches carrying the roadway rise 30ft [9.1m], but the footpaths upon either side are supported on secondary arches which have a span of 96ft [29.3m], a rise of only 10ft [3m], and spring from the piers at a height 20ft [6.1m] above the springing of the main arches. 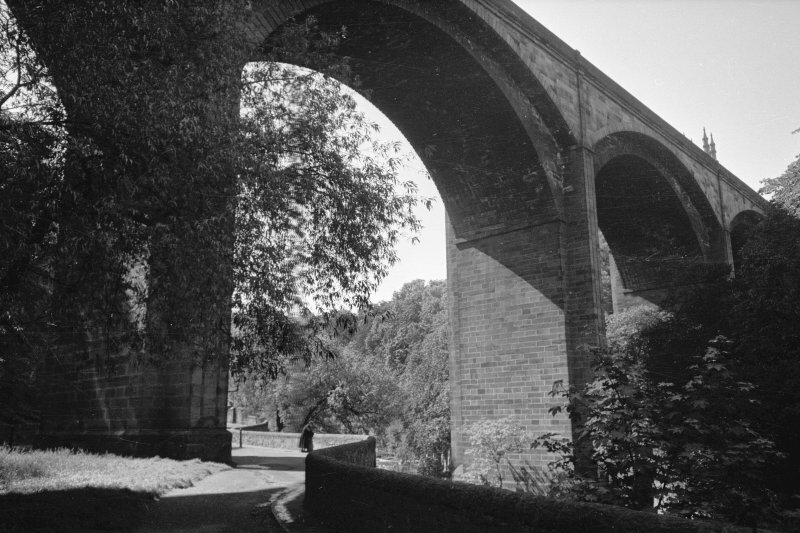 It seems likely that it was the praise which greeted his Over Bridge that led Telford to adopt this design, for although the effect is similar it has no practical motive. On the other hand, by masking the more massive main arches, the delicate footway arches do impart a deceptive impression of lightness to the structure. 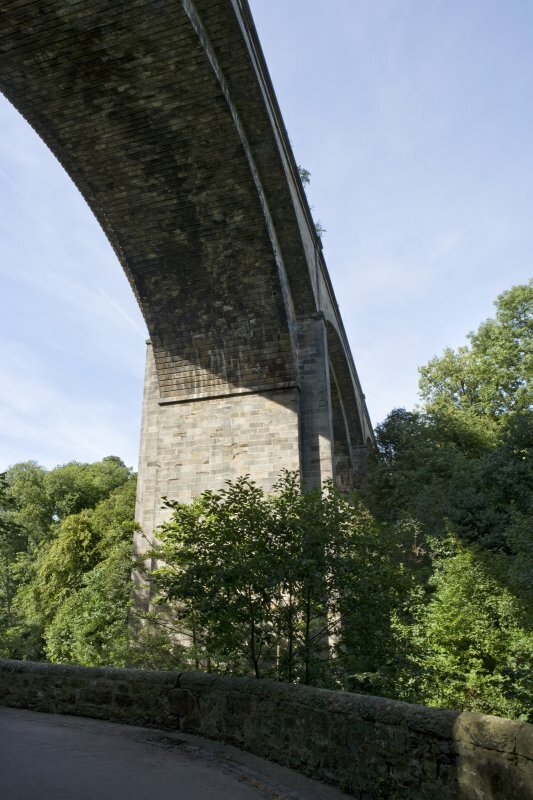 In order to reduce weight, the tall piers are one of the finest examples of that hollow wall construction which Telford first used at Pont Cysyllte [Pontcysyllte aqueduct, Wales]. 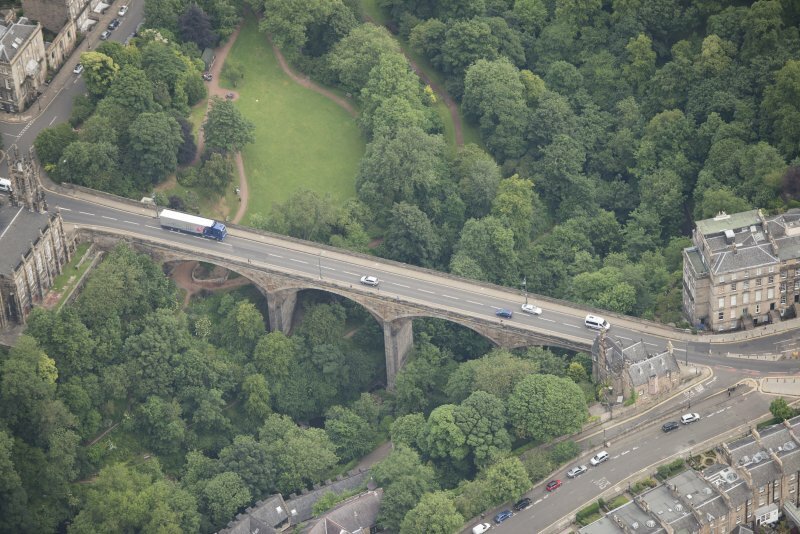 Charles Atherton was Telford's resident engineer for the Dean Bridge and John Gibb of Aberdeen the contractor. It was completed in 1831. After so great a number of suicides had flung themselves from it that it was nicknamed the 'Bridge of Sighs', the parapet was heightened. L T C Rolt 1979. 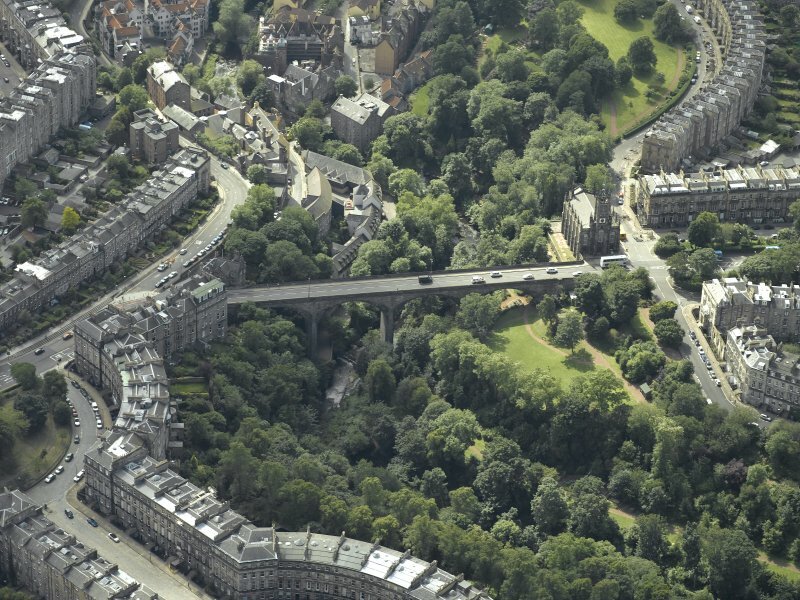 This impressive bridge carries Queensferry Road (which here forms the A90) over the deep gorge of the Water of Leith, within which are situated Dean Village and the Dean Gardens. 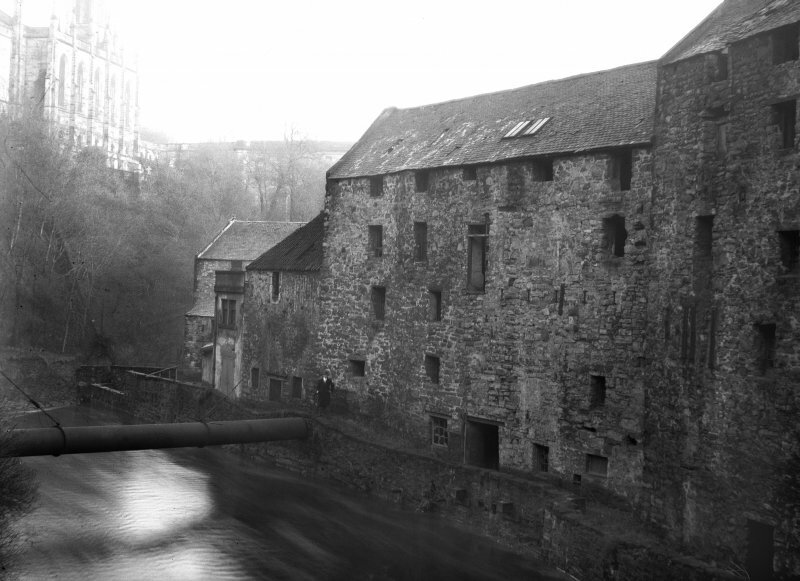 It thus forms the main routeway out of Edinburgh to the NW, and is particulatly impressive when seen from the Water of Leith Walkway, which passes beneath it. The location assigned to this record identifies the approximate midpoint of the structure. The available map evidence suggests that it extends from NT c. 24299 73938 to NT c. 24272 74000. No 1301	Elevation, sclae 1/2 inch to 10 feet, not as carried out. No 1314	"Center" intended for the three Northern arches, scale 1/4 inch to 1 foot. 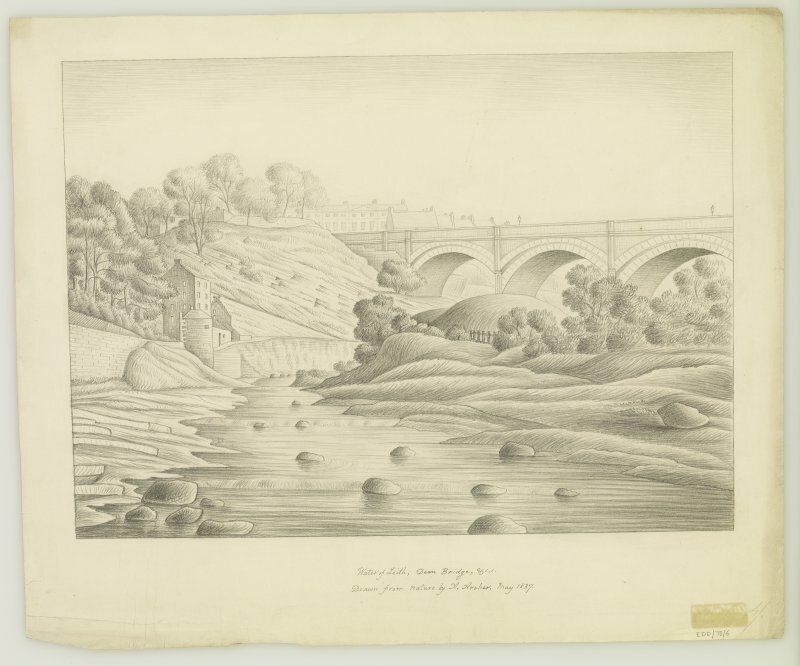 No 1570	Original Drawing in sepia of "Design for a Bridge over the Water of Leith adjacent to the City of Edinburgh" by Thomas Telford, F.R.S., L.& E., President of the Institution of Civil Engineers. 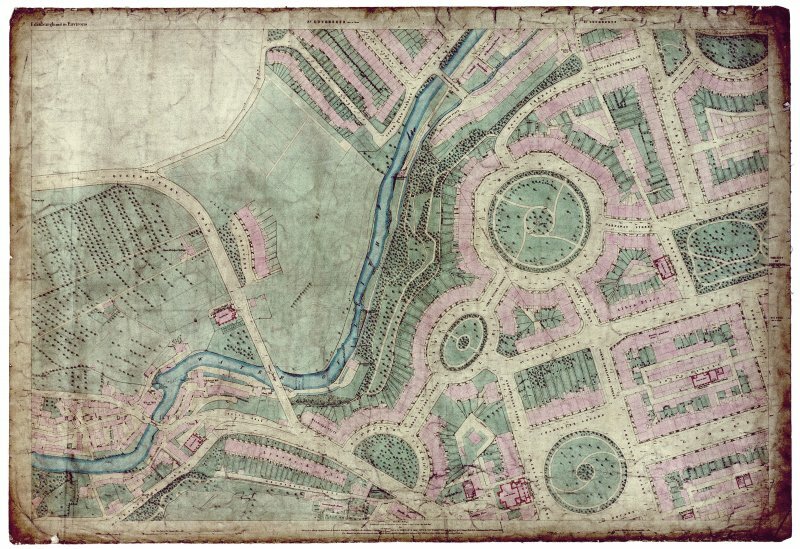 It is signed by Telford and dated London 8th May, 1829. Scale is 1 inch to 10 feet. The design shews a bridge of three arches. See NMRS EDD/73/2 and EDD/73/2/P for photographic copy. 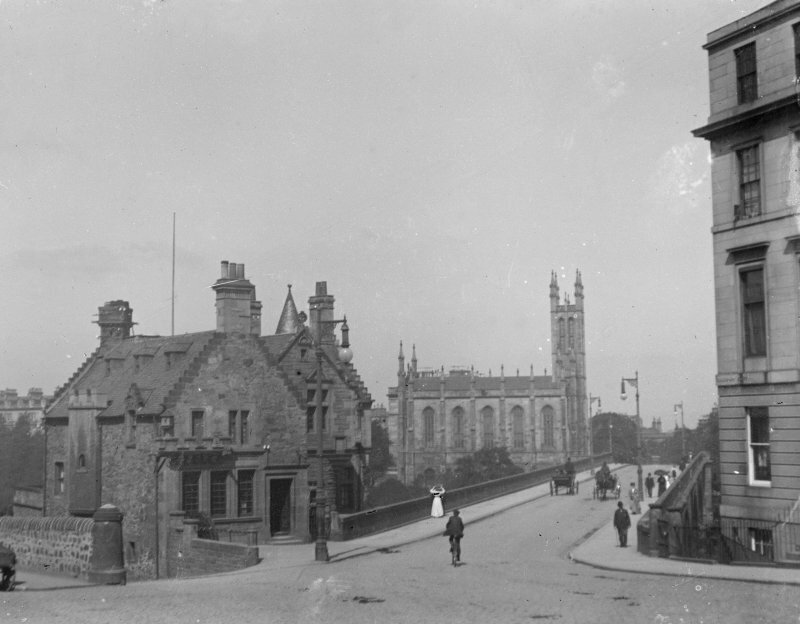 This is also catalogued as being called: 'Gloucester Bridge'. NMRS Plans: Photostat copies of the drawings numbered 1297, 1298, 1300 and 1570. 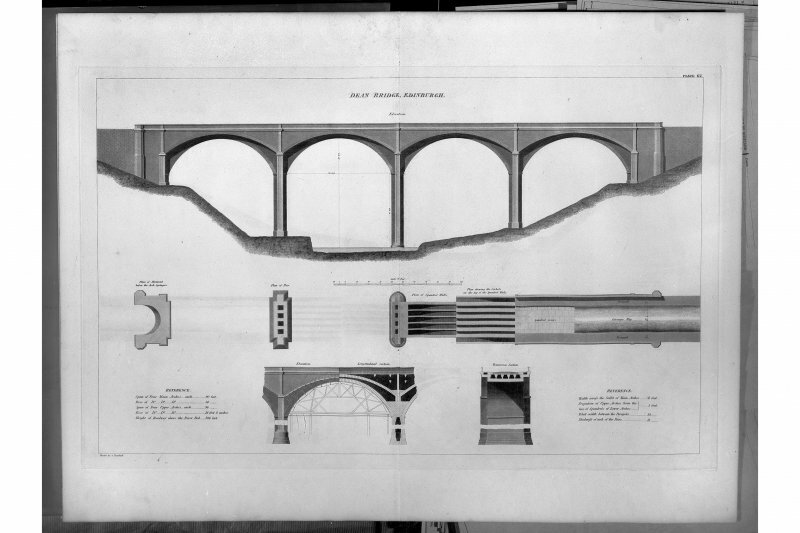 Nos 3/6 Diagram of heightened parapet and rail by A Rollo, 1948 in NMRS Historical File "Dean Bridge"
The Dean Bridge 'Spans the valley of the Water of Leith and now carries the heavy volume of traffic of the new Queensferry Road. 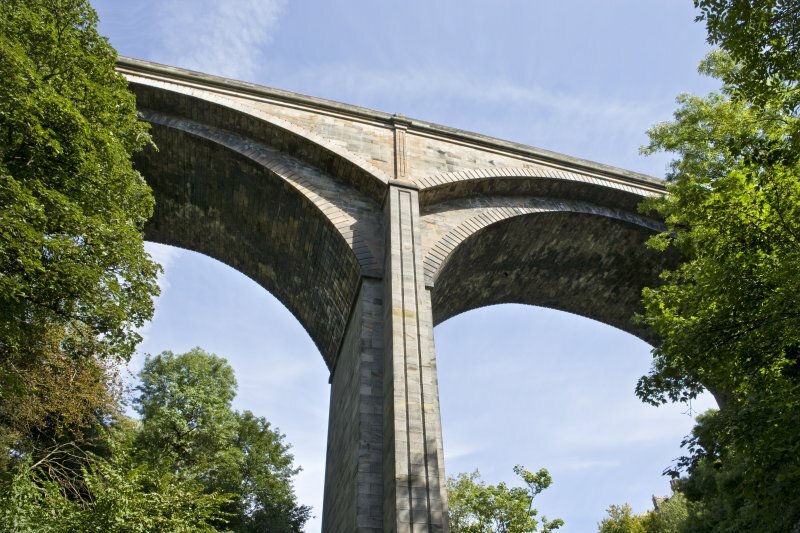 It was completed in 1833 from the design of Thomas Telford, F.R.S., the contractors being John Gibb & Son of Aberdeen. 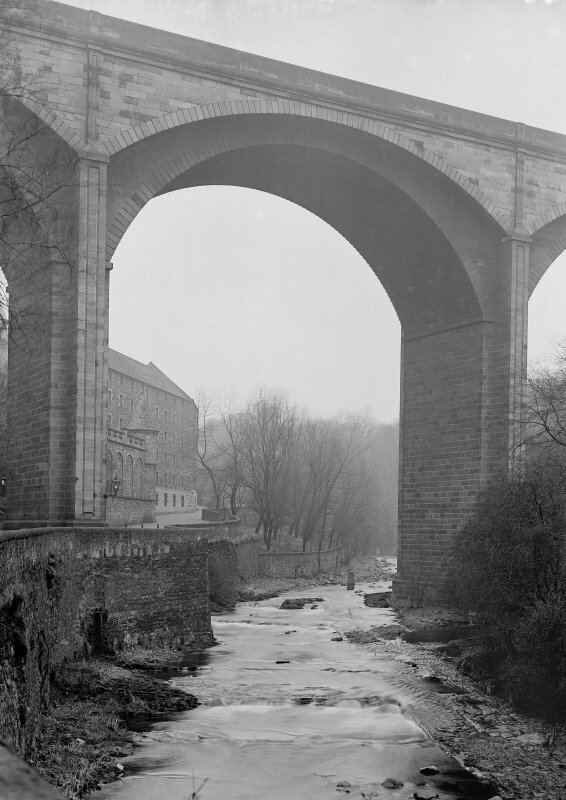 The total length of the Bridge is reckoned as 447 feet, and the roadway, 106 feet above the bed of the stream, is carried on four segmental arches, each of 90 feet span and springing from slender peirs. 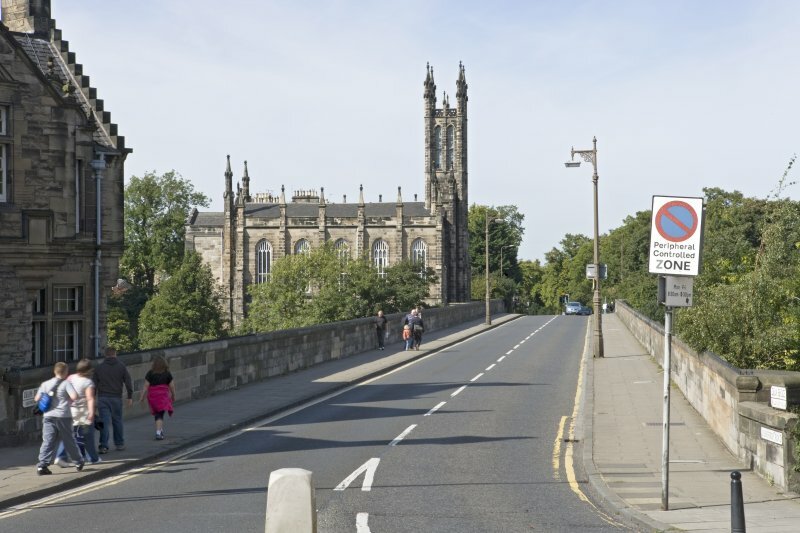 The whole width of the roadway is 39 feet between the parapets, the carriageway being now (1948) 23 feet in width and each footpath 8 feet. The main inner arches support the roadway, while the longer wing arches projecting 5 feet on each side, support the outer parts of the footpaths. 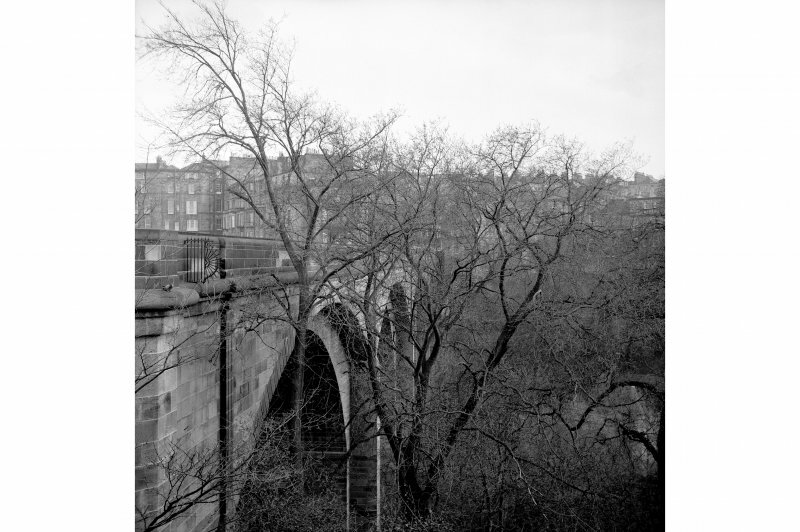 It is said (Grant "Old and New Edinburgh") that the major part of the cost of the Bridge was borne by the then Lord Provost, John Learmonth of Dean, his interest being that his own property beyond the ravine of the river should be opened up for building development. 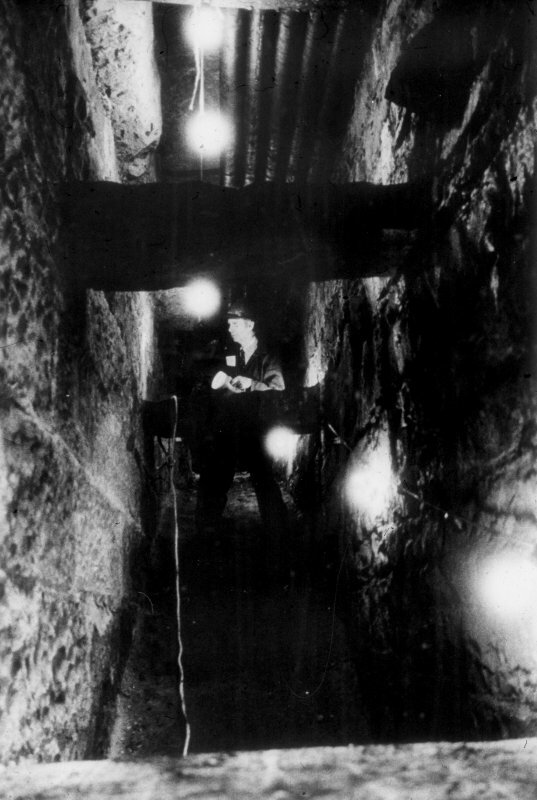 As early as 1885, as indicated by certain sketches in the custody of the City Architect, it was realised that the low height of the parapet wall on each side of the bridge constituted a danger as weak or misguided individuals, gazing down into the valley so far below, were impelled to precipitate themselves into the abyss - and that this danger must be averted. 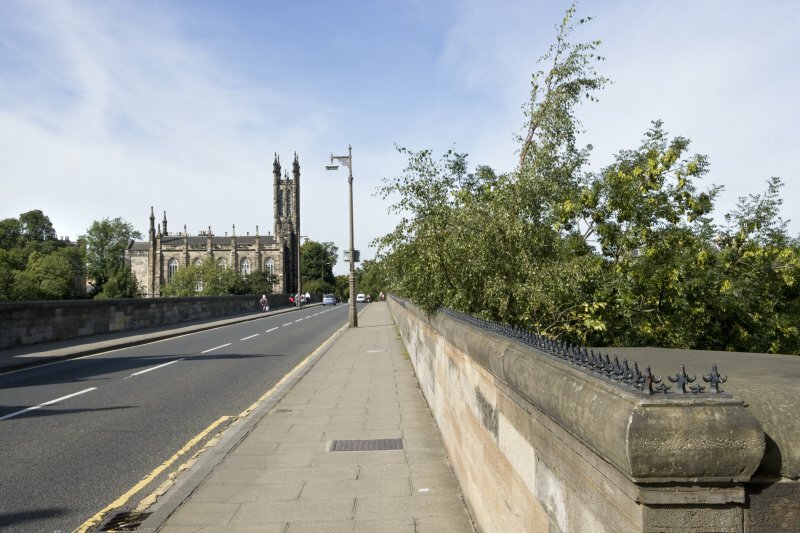 Eventually the parapet walls were raised by one course of stone, and the coping was replaced by one of the peculiar bulbous section surmounted by a rail studded with four-way decorative spikes. 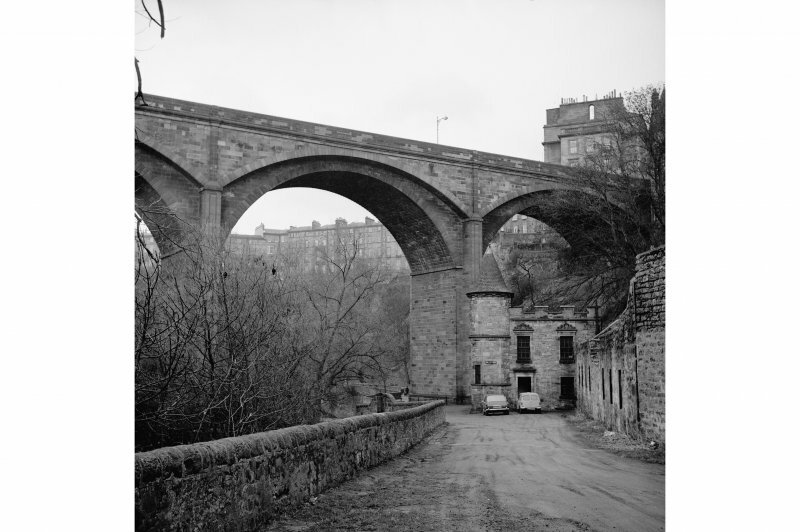 Photographs of the Dean Bridge taken by William Mckelvie c. 1970. 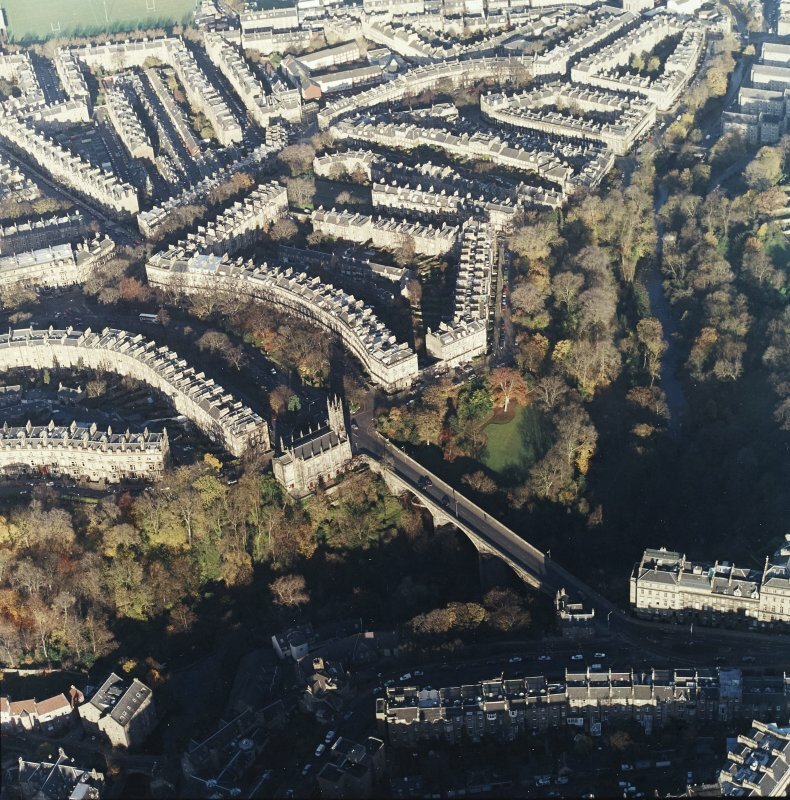 This was a building development-led project, in this case to facilitate the extension of the New Town across the Water of Leith. This led to the creation of the last major bridge to be completed by Telford before his death. 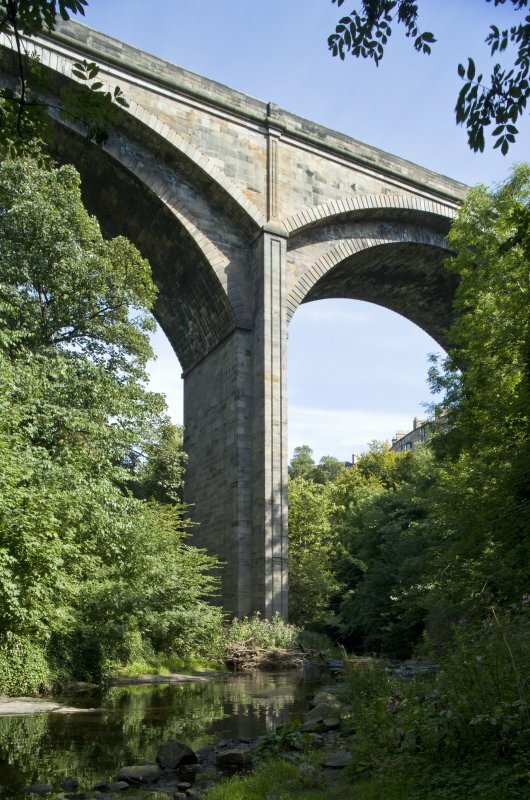 Constructed from 1829–32, it is perhaps the most majestic of all his masonry bridges, standing 106 ft above the river bed. 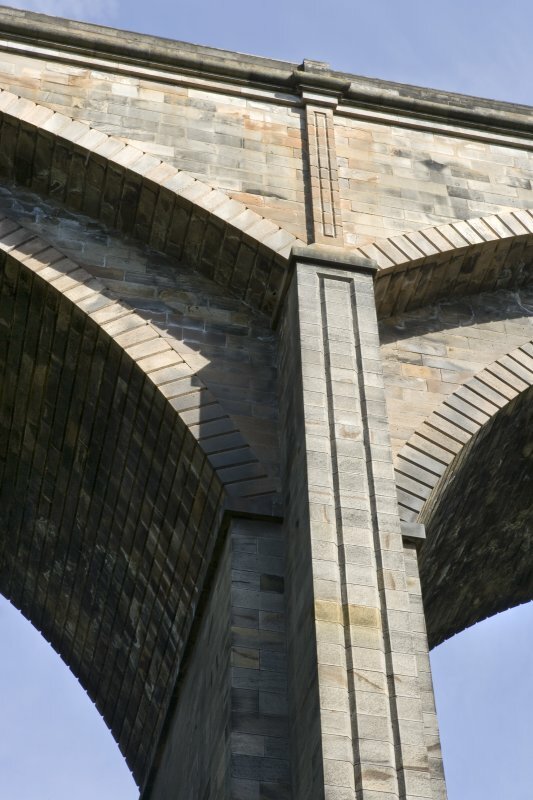 He originally intended it as a three-span Gothic style design but, perhaps fortunately for modern taste, foundation conditions and financial constraints resulted in the plain lines of the present bridge of four spans. 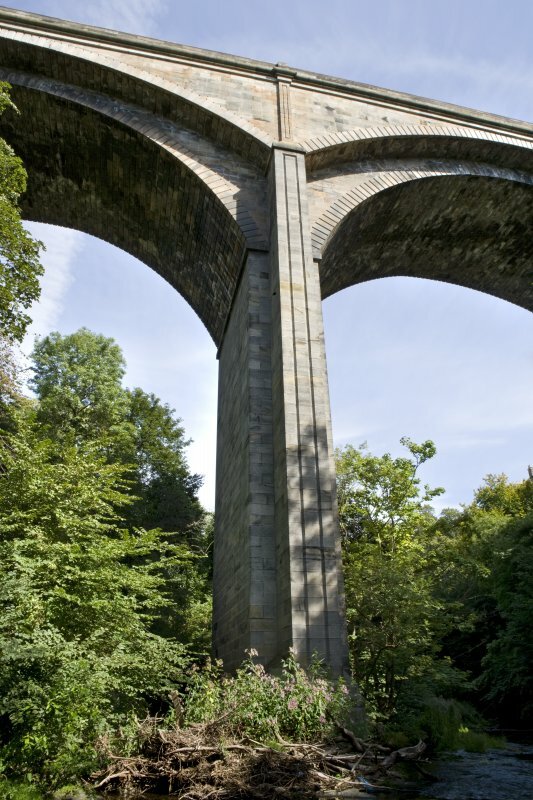 The bridge is 447 ft long and has four main segmental arches of 90 ft span and 30 ft rise carrying the carriageway. 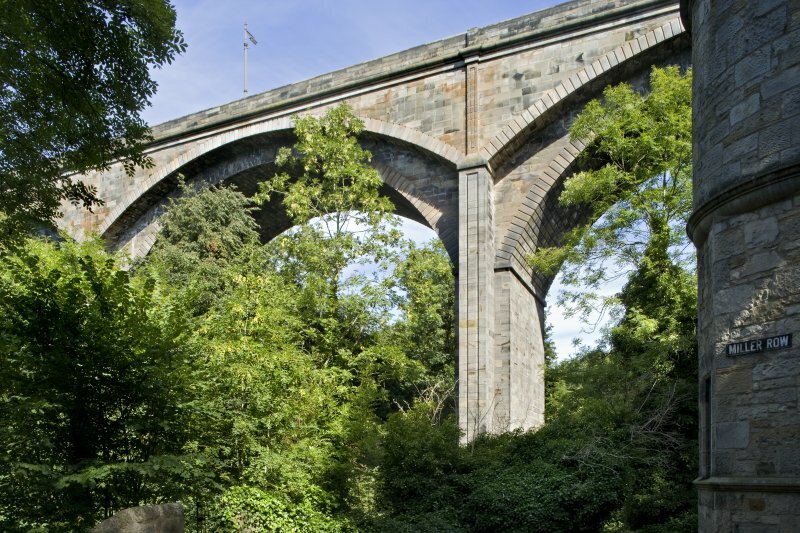 Alongside them, carrying the footpaths, are ascititious or external arches of 96 ft span and 10 ft rise springing from pilasters only 5 ft wide, the formation of which was a particularly delicate and unprecedented operation. As can be seen from the view, this feature gives the elevation an appearance of slenderness which seems almost incredible for a masonry bridge. The carriageway is 23 ft wide and the footways 8 ft. 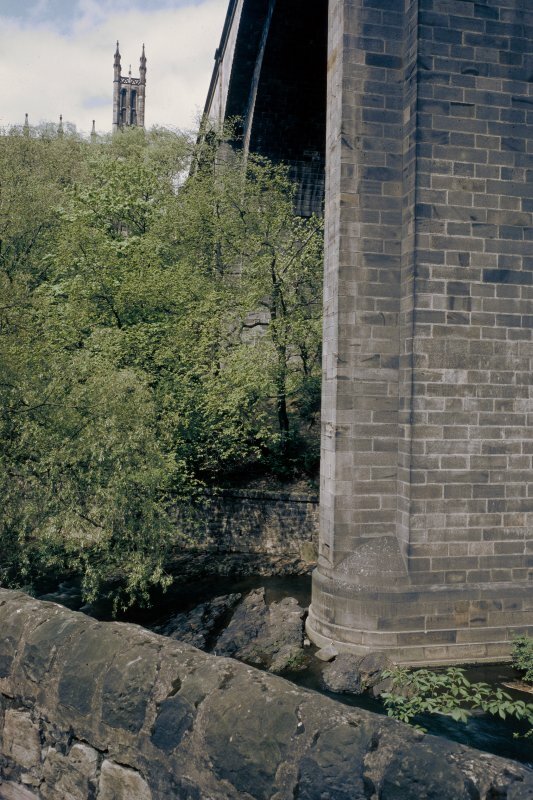 The bridge is of hollow spandrel construction with tie-stones between the longitudinal walls. 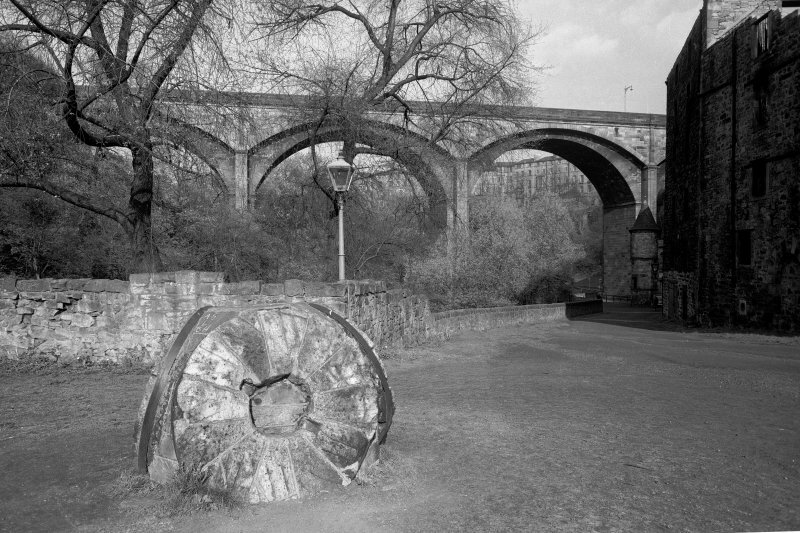 In 1972, under the writer’s 153direction, the 5 ft depth of fill above the main arch was investigated and it was found that a layer of broken freestone had been substituted, probably at the outset, for Telford’s traditional hand-pitched stone pavement, overlain with a 4 in. clay layer and 6 in. of weak lime concrete to prevent water penetration. Above this was mainly whinstone Macadam. 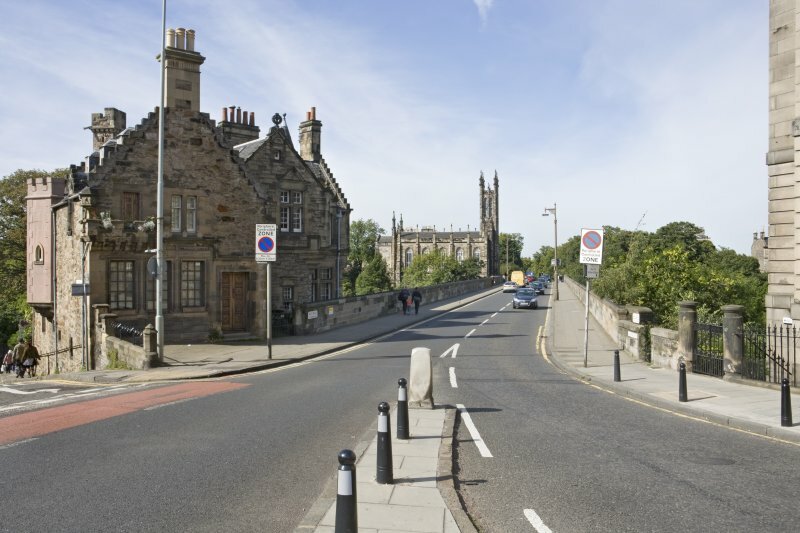 The contractor was John Gibb of Aberdeen and the cost was £18 556 exclusive of the approach roads. 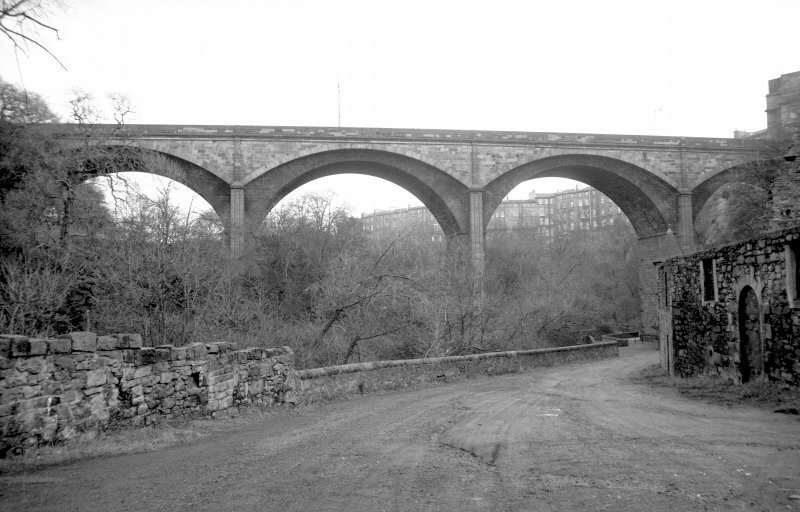 He is reputed to have finished the bridge ahead of time, but declined to hand it over to his building speculator client John Learmonth and the Cramond District Road Trust. Instead he is said to have opened the bridge and charged a toll until the completion date! Since then the bridge has required minimal maintenance and it now carries several million vehicles each year without any weight restriction.